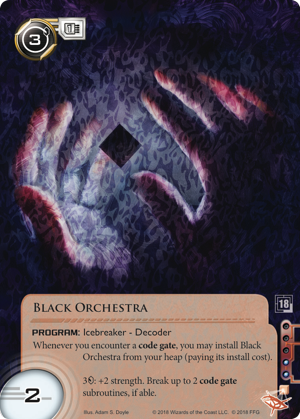 In the setting of Android: Netrunner, the network—that labyrinthine, ever-evolving mess of communications infrastructure—is more than a tool, more than a potential treasure trove, and more than a battlefield. It is humanity’s greatest cultural achievement. It links everyone in the world and beyond, and its data forms the digital language of our lives, our dreams, and our aspirations. The network—here—is also a metaphor. After all, there are two networks in Android: Netrunner, and both of them bring people together—allowing them to share their knowledge and experiences. Just as there is a network in the Android setting's not-too-distant future that connects earthlings with the citizens of Luna and Mars, and just as that network allows those people to communicate, work, and play together, there is a network of players that gives life to the game's high-stakes cyberstruggles. The game will soon end, and at that time it will no longer receive support from Organized Play, but the network of players will still exist. Accordingly, there's still cause for celebration. The 2018 Season Three Tournament Kit for Android: Netrunner offers you plenty of reason to go out and connect—or reconnect—with your local network of players. Meet new players. Play more games. Discover new strategies… And win cool prizes for getting involved! The 2018 Season Three Tournament Kit for Android: Netrunner will be the game's last official Tournament Kit. Season Three will lead us into the game's final World Championship at Android: Magnum Opus, and then the game will receive no more support from Organized Play. So… how resilient can you make your network? The Corps won't go away. The Runners won't go away. 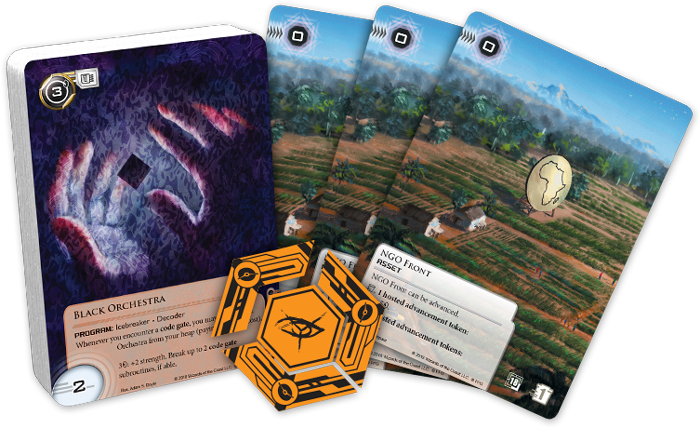 All the cards that have been designed and released will continue to circulate and tempt clever players with their whispers of hidden synergies and overlooked economic advantages. They'll continue to tempt Runners and Corps alike with their promises of rich rewards… never mind the risks. And if you're looking to backup your personal network, then you'll want to use your Season Three games and events as an opportunity to reinforce your core group and branch out to newer players. Whether you're looking to assemble a group of Runners and Corps committed to the game's cyberstruggles even after its conclusion—or if you're just looking to round out your collection of custom cards at the game's end—you'll find your efforts in Season Three rewarded by a variety pack of custom prizes, including seventeen Core Prize Cards, three Elite Prize Cards, and two Elite Prize Sets. One of the Core Prize Cards and one of the Elite Prize Cards are set aside for the event organizer to keep or distribute at their discretion, but the rest are for you to win, to collect, or to mesmerize fresh young Runners with the secrets of your favorite servers. Your path to anarchy begins as a thing of beauty with the 2018 Season Three Core Prize Card, an extended art version of Black Orchestra. 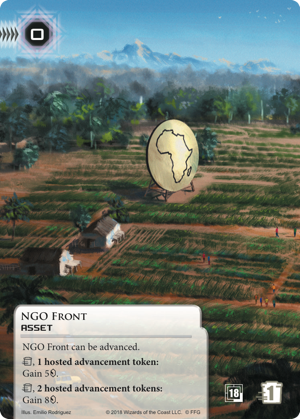 Even at the conclusion of the game's Organized Play, bluffs and counterbluffs remain as central as ever, and few cards will allow you to reveal your bluff as beautifully as the extended art NGO Front included in the Season Three Tournament Kit as an Elite Prize Card. Of course, you'll have to know a thing or two about bluffing in order to claim a copy. You'll need to make the Top 4 at a Season Three Critical Run Tournament if you hope to claim this card as your reward. 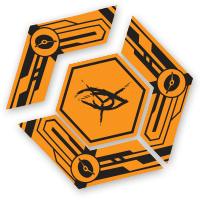 Alternatively, if you make the Top 4 at a Season Three Critical Run event, you might choose to claim one of the season's Elite Prize Sets, an Anarch-themed acrylic click tracker. Time is always ticking down, and you can count it down beat by beat by assembling your click tracker… or by pulling it apart. An isolated server may be safe from Runners, but it's worth nothing. The world of Android wasn't built on secrets that did nothing more than catch dust; it was built on the network—on the monumentally fast and efficient transfer of data that permeates every aspect of life. Your enjoyment of the game also depends on the network—your network of players—and the third season of 2018 Organized Play is your final chance to enjoy and take advantage of the game's official support. So talk to your favorite local retailer about getting involved. Get others involved. Revel in your games. Enjoy the prizes. Use them well. Always be running!